Character: Toasty and jammy notes with lightly vegetative flavor. Genmaicha is one of the world's most unique teas. The tea is usually made using Japanese Sencha or Bancha grade teas - ours is a steamed Sencha - and is blended with roasted rice kernels making the tea look as though it has been mixed with popcorn. 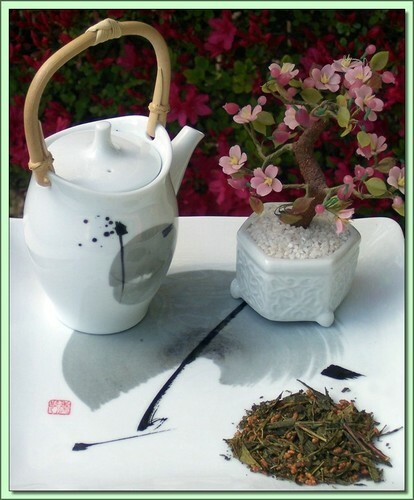 The flavor of Genmaicha is light, with mild nutty overtones. The tea can be brewed at a slightly higher temperature than most green teas in order to bring out this wonderfully mild flavor. Genmaicha is an excellent palate cleanser and is perfect for drinking with Asian-themed meals. This quality has made it one of the most popular teas in Japan. This tea is grown organically; no pesticides or chemical fertilizers were used in its production. Certified Organic by QMI Organic Inc. Certificate #: 150 - 200. USDA Certified Organic.